Premise- Host Jeff Dye approaches a random pedestrian on the street and engages them in the three-round solo game. After agreeing to play the game, the contestant will be wearing an earpiece to hear the host and two special guests feed them instructions. 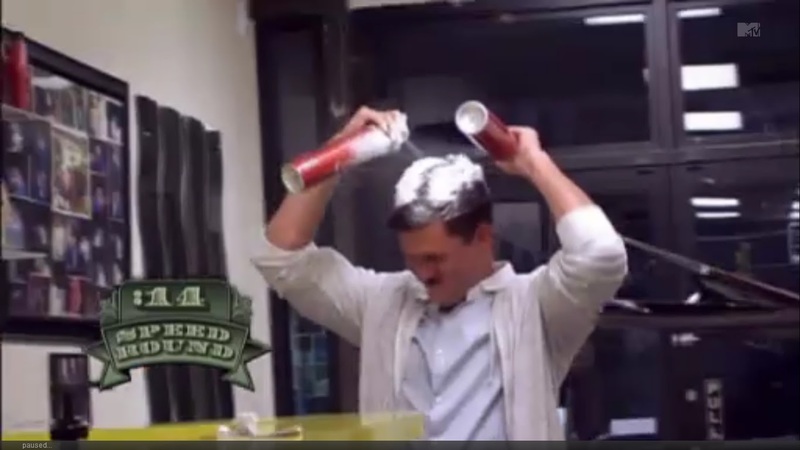 The contestant must perform ludicrous, ridiculous, and weird tasks in a public establishment, which are designed to make the people around them as uncomfortable and annoyed as possible. If they fail to complete any task, they will not be awarded with any cash. In round one, the contestant has to successfully complete eight tasks worth $50 each. In the second round, the contestant has to complete three more tasks worth $100 each. As the game progresses, the tasks will get harder and more ridiculous. In the third round, the “Speed Round”, the contestant will have to perform a certain activity in 30 seconds. The game ends when a contestant want to either stop playing the game or if they were kicked out of the establishment by the owner or the police were showing up to kick them out. By completing all the tasks in the game without getting caught, the contestant could win up to $1,000 in cash. Money From Strangers is a lot like Game Show In My Head and Nickelodeon’s You’re On. Some of the reasons why this game show will last for more than one season (as opposed to the aforementioned shows) is because of the rapid-fire game play, the stunts aren’t dragged out for an unnecessary amount of time, and the show is not completely dependent on a weekend time slot. Like most MTV game shows, Money From Strangers is a good game show filled with humor, mischief, and fun. It’s essentially a game show version of Candid Camera. This is definitely more of a psychological and mental game show to test the limits of complete strangers who are the victims of these stunts and to see how bad the contestants want to win the money by completing these stupid stunts. Like Silent Library, this show is one huge social experiment. Jeff Dye does a good job of hosting the show and engaging and entertaining the contestants throughout each stunt. My only concern with the show is the safety of the contestants. In the two episodes I have seen so far, there were two contestants who have had the police called on them. My fear is that the contestants will actually get arrested by the police or get into a fight with a customer in the establishment or with the store owner. I hope none of the games will escalate to that level, but we’ll see what happens as the series progresses. Overall, Money From Strangers is an interesting, comical, and entertaining game show with a solid format. Jeff Dye does a good job of keeping the show moving and aiding to the mischief and chaos within each episode. I can see this show lasting for at least two seasons and I hope to see more of this show in the future. Watch new episodes of Money From Strangers every Monday night at 10:30pm on MTV!! !